I’ve been a bit cynical about RSD in the past, seeing it as a just a day when record collectors and eBay touts all turn up at once and crowd the place out. As an average punter it would put me off, frankly. And surely that’s not what RSD is about? I did like this, though. And thanks to Every Record Tells a Story for pointing it out. This entry was posted in Witterings and tagged Music, Record store day, Vinyl. Bookmark the permalink. Good record shops are intoxicating whatever the day, but celebrating them once a year is A Very Good Thing in my book. The fact that it generates a tonne of publicity is probably worth it. I took the 10 year old to Jumbo in Leeds the other week, and his reaction was a brilliant example of why places like that are important. He mooched around the racks for a while, thumbing through CD cases and record sleeves, completely lost in it all, studying the back of an old Stones record, trying to work out which tracks he already had on his iPod. They put something he recognised on and his face lit up. He sidled up to me later and whispered “Dad, I love it here…can we come again?”. Something that brought it all into sharp focus however was the lack of representation in certain areas. In Nottingham, where I stayed during RSD weekend, there was only one participating store. One! In a twenty mile radius of Nottingham city centre. The same could be said for Leicester too. Use it or lose it. 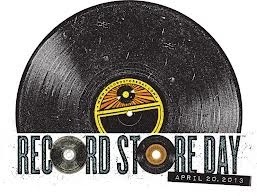 But not just on Record Store Day.